Energy production within a cell involves many coordinated chemical pathways. Most of these pathways are combinations of oxidation and reduction reactions. Oxidation and reduction occur in tandem. An oxidation reaction strips an electron from an atom in a compound, and the addition of this electron to another compound is a reduction reaction. Because oxidation and reduction usually occur together, these pairs of reactions are called oxidation-reduction reactions, or redox reactions. The removal of an electron from a molecule, oxidizing it, results in a decrease in potential energy in the oxidized compound. The electron (sometimes as part of a hydrogen atom) does not remain unbonded, however, in the cytoplasm of a cell. Rather, the electron is shifted to a second compound, reducing the second compound. The shift of an electron from one compound to another removes some potential energy from the first compound (the oxidized compound) and increases the potential energy of the second compound (the reduced compound). The transfer of electrons between molecules is important because most of the energy stored in atoms and used to fuel cell functions is in the form of high-energy electrons. The transfer of energy in the form of electrons allows the cell to transfer and use energy in an incremental fashion—in small packages rather than in a single, destructive burst. This chapter focuses on the extraction of energy from food. You will see that as you track the path of the transfers, you are tracking the path of electrons moving through metabolic pathways. In living systems, a small class of compounds functions as electron shuttles: they bind and carry high-energy electrons between compounds in pathways. The principal electron carriers we will consider are derived from the B vitamin group and are derivatives of nucleotides. These compounds can be easily reduced (that is, they accept electrons) or oxidized (they lose electrons). Nicotinamide adenine dinucleotide (NAD) (Figure 4.13) is derived from vitamin B3, niacin. NAD+ is the oxidized form of the molecule; NADH is the reduced form of the molecule after it has accepted two electrons and a proton (which together are the equivalent of a hydrogen atom with an extra electron). When electrons are added to a compound, they are reduced. A compound that reduces another is called a reducing agent. In the above equation, RH is a reducing agent, and NAD+ is reduced to NADH. When electrons are removed from compound, it is oxidized. A compound that oxidizes another is called an oxidizing agent. In the above equation, NAD+ is an oxidizing agent, and RH is oxidized to R.
Similarly, flavin adenine dinucleotide (FAD+) is derived from vitamin B2, also called riboflavin. Its reduced form is FADH2. A second variation of NAD, NADP, contains an extra phosphate group. Both NAD+ and FAD+ are extensively used in energy extraction from sugars, and NADP plays an important role in anabolic reactions and photosynthesis. 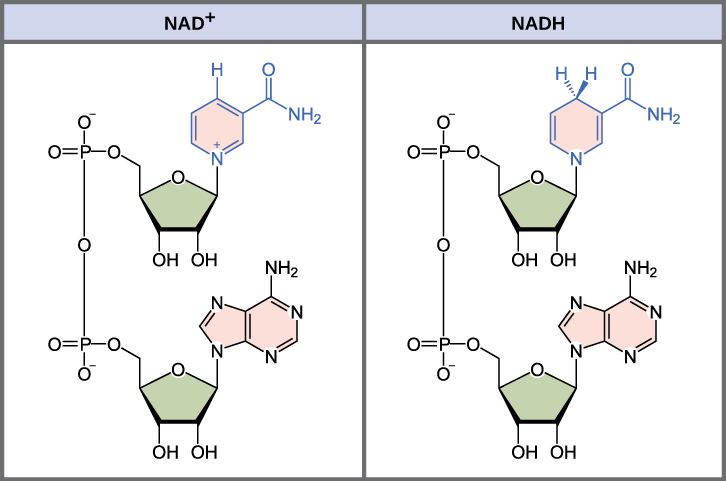 Figure 4.13 The oxidized form of the electron carrier (NAD+) is shown on the left and the reduced form (NADH) is shown on the right. The nitrogenous base in NADH has one more hydrogen ion and two more electrons than in NAD+. A living cell cannot store significant amounts of free energy. Excess free energy would result in an increase of heat in the cell, which would result in excessive thermal motion that could damage and then destroy the cell. Rather, a cell must be able to handle that energy in a way that enables the cell to store the energy safely and release it for use only as needed. Living cells accomplish this by using the compound adenosine triphosphate (ATP). ATP is often called the “energy currency” of the cell, and, like currency, this versatile compound can be used to fill any energy need of the cell. How? It functions similarly to a rechargeable battery. When ATP is broken down, usually by the removal of its terminal phosphate group, energy is released. The cell uses the energy to do work, usually by the released phosphate binding to another molecule, activating it. For example, in the mechanical work of muscle contraction, ATP supplies the energy to move the contractile muscle proteins. Recall the active transport work of the sodium-potassium pump in cell membranes. ATP alters the structure of the integral protein that functions as the pump, changing its affinity for sodium and potassium. In this way, the cell performs work, pumping ions against their electrochemical gradients. 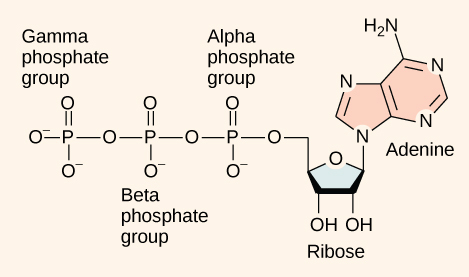 At the heart of ATP is a molecule of adenosine monophosphate (AMP), which is composed of an adenine molecule bonded to a ribose molecule and a single phosphate group (Figure 4.14). Ribose is a five-carbon sugar found in RNA, and AMP is one of the nucleotides in RNA. The addition of a second phosphate group to this core molecule results in the formation of adenosine diphosphate (ADP); the addition of a third phosphate group forms adenosine triphosphate (ATP). Figure 4.14 ATP (adenosine triphosphate) has three phosphate groups that can be removed by hydrolysis to form ADP (adenosine diphosphate) or AMP (adenosine monophosphate).The negative charges on the phosphate group naturally repel each other, requiring energy to bond them together and releasing energy when these bonds are broken. The addition of a phosphate group to a molecule requires energy. Phosphate groups are negatively charged and thus repel one another when they are arranged in series, as they are in ADP and ATP. This repulsion makes the ADP and ATP molecules inherently unstable. The release of one or two phosphate groups from ATP, a process called dephosphorylation, releases energy. Even exergonic, energy-releasing reactions require a small amount of activation energy to proceed. However, consider endergonic reactions, which require much more energy input because their products have more free energy than their reactants. Within the cell, where does energy to power such reactions come from? The answer lies with an energy-supplying molecule called adenosine triphosphate, or ATP. ATP is a small, relatively simple molecule, but within its bonds contains the potential for a quick burst of energy that can be harnessed to perform cellular work. This molecule can be thought of as the primary energy currency of cells in the same way that money is the currency that people exchange for things they need. ATP is used to power the majority of energy-requiring cellular reactions. A living cell cannot store significant amounts of free energy. Excess free energy would result in an increase of heat in the cell, which would denature enzymes and other proteins, and thus destroy the cell. Rather, a cell must be able to store energy safely and release it for use only as needed. Living cells accomplish this using ATP, which can be used to fill any energy need of the cell. How? It functions as a rechargeable battery. When ATP is broken down, usually by the removal of its terminal phosphate group, energy is released. This energy is used to do work by the cell, usually by the binding of the released phosphate to another molecule, thus activating it. For example, in the mechanical work of muscle contraction, ATP supplies energy to move the contractile muscle proteins. At the heart of ATP is a molecule of adenosine monophosphate (AMP), which is composed of an adenine molecule bonded to both a ribose molecule and a single phosphate group (Figure 4.15). Ribose is a five-carbon sugar found in RNA and AMP is one of the nucleotides in RNA. The addition of a second phosphate group to this core molecule results in adenosine diphosphate (ADP); the addition of a third phosphate group forms adenosine triphosphate (ATP). Figure 4.15 The structure of ATP shows the basic components of a two-ring adenine, five-carbon ribose, and three phosphate groups. The addition of a phosphate group to a molecule requires a high amount of energy and results in a high-energy bond. Phosphate groups are negatively charged and thus repel one another when they are arranged in series, as they are in ADP and ATP. This repulsion makes the ADP and ATP molecules inherently unstable. The release of one or two phosphate groups from ATP, a process called hydrolysis, releases energy. You have read that nearly all of the energy used by living things comes to them in the bonds of the sugar, glucose. Glycolysis is the first step in the breakdown of glucose to extract energy for cell metabolism. Many living organisms carry out glycolysis as part of their metabolism. Glycolysis takes place in the cytoplasm of most prokaryotic and all eukaryotic cells. Glycolysis begins with the six-carbon, ring-shaped structure of a single glucose molecule and ends with two molecules of a three-carbon sugar called pyruvate. Glycolysis consists of two distinct phases. In the first part of the glycolysis pathway, energy is used to make adjustments so that the six-carbon sugar molecule can be split evenly into two three-carbon pyruvate molecules. 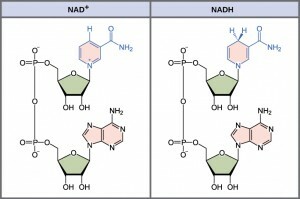 In the second part of glycolysis, ATP and nicotinamide-adenine dinucleotide (NADH) are produced (Figure 4.16). If the cell cannot catabolize the pyruvate molecules further, it will harvest only two ATP molecules from one molecule of glucose. For example, mature mammalian red blood cells are only capable of glycolysis, which is their sole source of ATP. If glycolysis is interrupted, these cells would eventually die. Figure 4.16 In glycolysis, a glucose molecule is converted into two pyruvate molecules. ATP functions as the energy currency for cells. It allows cells to store energy briefly and transport it within itself to support endergonic chemical reactions. 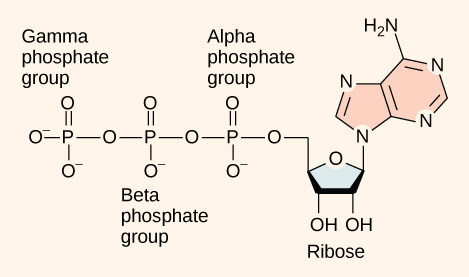 The structure of ATP is that of an RNA nucleotide with three phosphate groups attached. 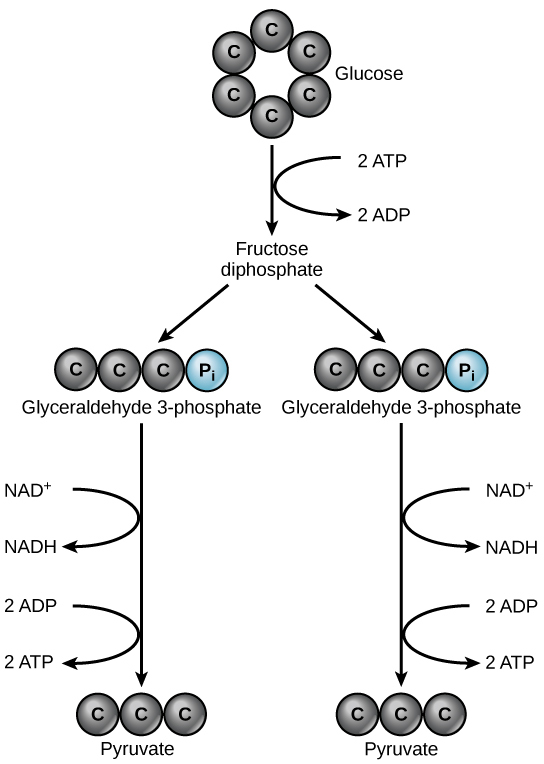 As ATP is used for energy, a phosphate group is detached, and ADP is produced. Energy derived from glucose catabolism is used to recharge ADP into ATP. Glycolysis is the first pathway used in the breakdown of glucose to extract energy. Because it is used by nearly all organisms on earth, it must have evolved early in the history of life. Glycolysis consists of two parts: The first part prepares the six-carbon ring of glucose for separation into two three-carbon sugars. Energy from ATP is invested into the molecule during this step to energize the separation. The second half of glycolysis extracts ATP and high-energy electrons from hydrogen atoms and attaches them to NAD+. Two ATP molecules are invested in the first half and four ATP molecules are formed during the second half. This produces a net gain of two ATP molecules per molecule of glucose for the cell. Energy is stored long-term in the bonds of _____ and used short-term to perform work from a(n) _____ molecule. The energy currency used by cells is _____. The glucose that enters the glycolysis pathway is split into two molecules of _________. Both prokaryotic and eukaryotic organisms carry out some form of glycolysis. How does that fact support or not support the assertion that glycolysis is one of the oldest metabolic pathways? If glycolysis evolved relatively late, it likely would not be as universal in organisms as it is. It probably evolved in very primitive organisms and persisted, with the addition of other pathways of carbohydrate metabolism that evolved later. 4.2 Glycolysis by Charles Molnar and Jane Gair is licensed under a Creative Commons Attribution 4.0 International License, except where otherwise noted.